evangelizing the (digital) natives : Why Are People STILL Upset with "New" Math? You've seen the social media post like this, right? Just a few weeks ago we had a 6th grade parent at my school's curriculum night ask why our book had the kids performing so much estimation. The answer we gave was so that when the student gets a ridiculous answer to some other problem, they have a tool at their disposal to realize that they've made a mistake. Who likes avoidable mistakes? No one does. People can get behind that. 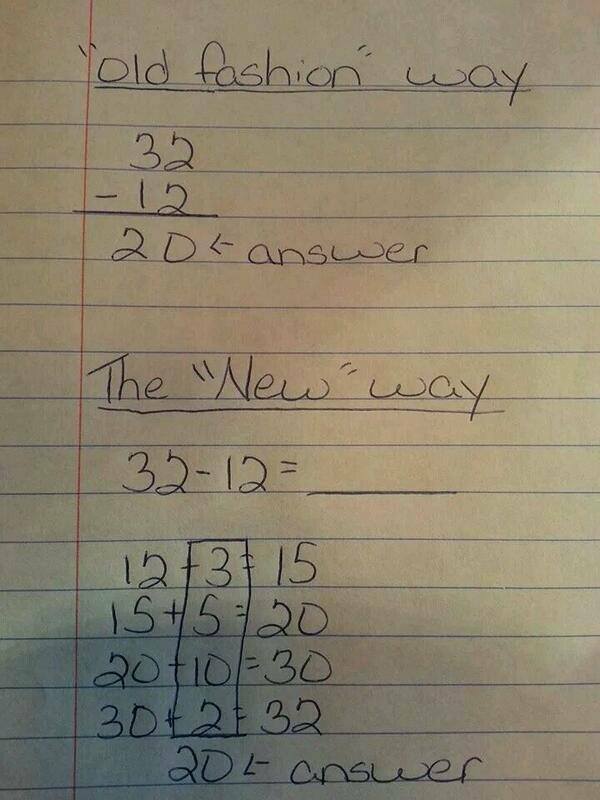 This "new math" matter came up again this week when I saw a teacher friend share her son's recent math test. I haven't asked her yet, but I'm pretty sure her stance is that this is ridiculous. My teacher friend is upset that her son had gotten 15% off because, in his model of 5 minus 2, he had not shown the subtraction by crossing out 2 crayons because "that's not how he thinks." 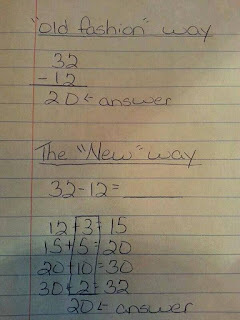 I get that argument, but at the same time, if all the classroom instruction had been, "show your subtraction thinking by crossing out sets," and he didn't do it, then it has to be graded that way. It's a bummer that this kid got an 85%, no doubt, but did he do as well on the question as a kid who came to the same conclusion, but DID make the Xs? Perhaps the wording of the question is really the problem, and an oral explanation would have solved this whole problem, but it's not fair to the kid who DID do everything he or she were asked to get a similar score as the kid who did not. There are classrooms everywhere in which teachers take off points for late work, formatting papers incorrectly, not using the right pen, or miscellaneous other pet peeves that are far more arbitrary than this student showing his thinking by crossing out two pictures. I'm defending those arbitrary deductions - I think they're often disgusting and seriously limit low-socioeconomic students who do not play the "school" game as well as others. I am appealing to you that there is a legitimate cognitive demand to show reasoning in the question that the student has not completed. Let's step out of the math argument, because it tends to be polarizing, and step into the English-Language Arts classroom instead. Elementary teachers instruct on the use of punctuation and assess it frequently, I'm sure. If the screenshot above were a punctuation quiz and he had failed to use the correct punctuation because "he doesn't think that way," we're not having this conversation, right? Where are the social media posts bemoaning ELA teachers who correct comma punctuation that parents don't understand. "We don't do commas. Short, simple sentences worked good enough for me." There's an implicit cultural assumption that parents and schools commit to when we open the doors, and parents send their treasures to use. Schools agree to teach children what the parents don't have the time, money, or intellectual resources to teach themselves, and parents agree to partner with us to get their kid to "success." (Although that definition is up for grabs, too. See Last Chance U on Netflix, and my post on the film Most Likely to Succeed, both produced by a talented man named Greg Whiteley). Parents, its okay if you don't get the intricacies of the lessons your child's teachers have spent hours and hours delivering in a classroom. I don't think we're asking you to, either. Maybe we need to rewrite our contract. Maybe we're giving too much homework. Maybe we need to start writing ALL of our students individualized learning plans. Maybe we need alternative forms of assessment so this kid doesn't have an 85% for a momentary lapse in attention to detail. We can do all of these things. Let's just finally stop blaming "new math." Please.